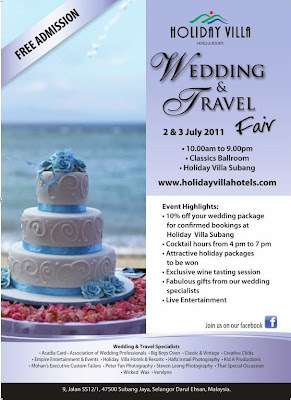 Holiday Villa's Wedding and Travel Fair is making a comeback this year with over 20 exhibitors this 2 & 3 July 2011. The location will be at the Classics Ballroom in Holiday Villa Hotel & Suites Subang. Open from 10am - 9pm, the free entry fair offers a one-stop centre where you can find various things for a complete wedding. Be sure to be present around 4-7pm where during this "cocktail hour", there'll be fashion shows, entertainment, make-up demonstrations and lucky draws. On the 2nd of June, 2011, I went to witness the Cocktail Prelude to the Wedding and Travel Fair. With some chow that I gathered, I nom away as I listen to the introduction of the Wedding and Travel Fair made by Mr. Tony Sabastian. The chosen staff to model as the bride and groom in front of the wedding cake. So far, what we've seen are the wedding part, so what about the travel part? Well, during the Wedding and Travel Fair, Holiday Villa Hotels & Resorts will be selling holiday vouchers for their resorts in Langkawi, Cherating, Bali, Phnom Penh, and Halong Bay where you buy 5, you'll get one free. For those who are a Facebook fan for Holiday Villa, in addition to some extra goodies, they also only need to buy 3 to get one free. That place looks lovely. It would surely be romantic to be wedded there at Holiday Villa. The food looks delicious too.